The Trick House is owned by the Trick Master, who creates puzzles to challenge curious trainers. Every time you enter, the room appears empty, though you will feel like you're being watched. The trick here is to spot the small sparkle. Approach the spot the sparkle was coming from and you'll find the one and only, Trick Master! He'll praise you for your sharp eye and gives you access to the puzzle room, which is behind the scroll on the back wall. You can only do each puzzle once and in a set order, and new puzzles will be available after you defeat gym leaders. Each puzzle has a "gimmick" to them, which will be explained in more detail below. The first puzzle is available from the start, and it isn't even a puzzle! All it requires is for you to use Cut on the trees that block your way in the maze. 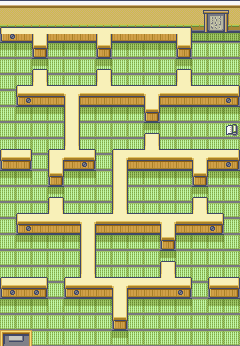 You'll need to battle some trainers, but the ultimate goal is to find the scroll located somewhere in the room that contains the password and then make your way to the door at the top right which requires the password. You don't have to memorise the password yourself, but you do have to find the scroll that has it. 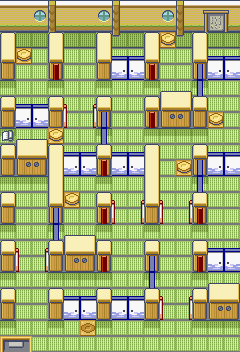 The room's layout varies between Ruby/Sapphire and Emerald. There is an Orange Mail near the exit, though it requires you to do more cutting to reach it. Complete the challenge and you get a Rare Candy. A very good prize, though it's a pity you can only get it once. Step on the switches to cover the holes leading to the scroll. Memorize the password on the scroll, and enter it at the door to win. 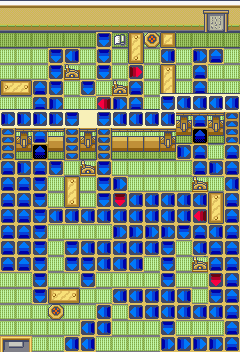 This level also contains three Trainers, Wave Mail, and Harbor Mail. Completion of the level earns you a Timer Ball. This puzzle requires the Heat Badge and HM06, Rock Smash. There will be a room full of red and blue doors that close and open based on their color. Some switches are covered by Rocks that can be smashed. A Wood Mail and a Shadow Mail can be found. 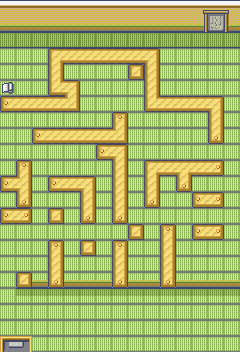 Completing this puzzle grants the player a Hard Stone, which boosts the power of Rock-type moves by 20% when held. Completing this puzzle grants the Smoke Ball. Completing this puzzle grants TM12 (Taunt). The Mind Badge is necessary to unlock this puzzle. It is composed of flipping gates similar to those found in Fortree Gym. A Glitter Mail can be found. 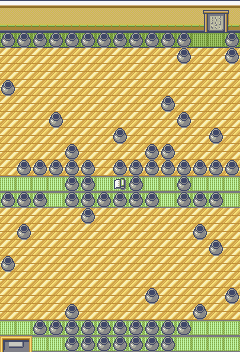 Completing this puzzle will grant a Magnet, which powers up Electric-type moves. To attempt this puzzle, one must first earn the Rain Badge. 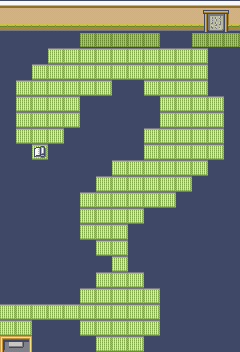 This puzzle is composed of spinning tiles, similar to the one found in Mossdeep Gym. Switches must be pulled to adjust the direction of red tiles. A Tropic Mail can also be found in the room. Completing this puzzle will grant a PP Max. To attempt this puzzle, the final one offered at the Trick House, one must first defeat the Elite Four. 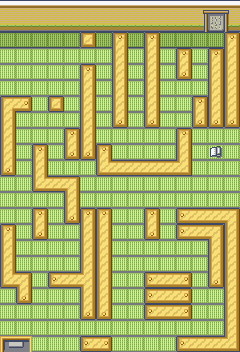 Much like the ice puzzles in many games, this one has you sliding across the floor until you hit an obstacle. In this puzzle, you may find a Bead Mail and a Nugget. Completing this puzzle will grant the Blue Tent or Red Tent ornament, depending on the version of the game you're playing. In Emerald the player can choose which one they want. 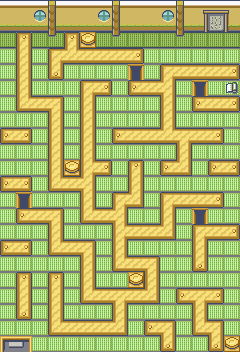 In Emerald all 8 rooms have slightly different layouts, but the puzzles are essentially the same. This page was last edited on 29 November 2018, at 06:51. This page has been accessed 154,668 times.